So today I thought I would try a couple of my untried polishes. 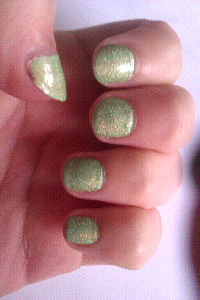 I decided to use a Color Club green from the Poptastic collection I got from Debbie over at The Crumpet last week. 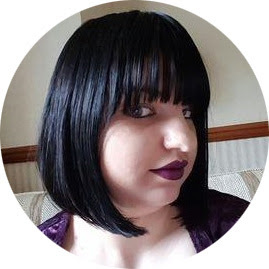 (You can see my orginal post on the colours I got here). I think it is pretty normal for Color Club polishes which came in a set not to be labelled, but I managed to do a bit of internet-stalking and found that this green is called Twiggie. Twiggie is a pale green creme which just starts to border on neon. 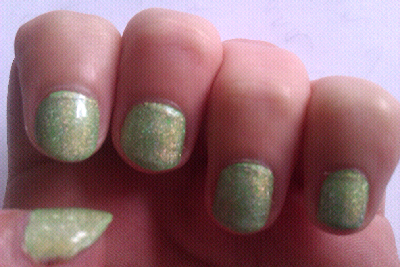 It's the lovechild of a lime green and mint green polish. On the nail it applies quite streaky I used two coats but it could use three for a truely even finish. Anyway i then topped Twiggie with Milani Hi-Tech from the 3D Holographic collection. Everyone says that of the 3D polishes Hi-Tech is the most linear holo of the collection and with my love of all things green at the moment I couldn't really turn this polish down. This came with my mega Kleancolor order from Beautyjoint.com a few months back. 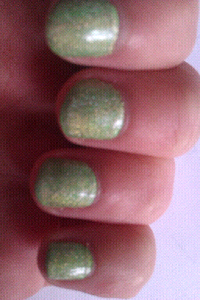 Hi-Tech is a lime green holographic polish. Sadly there is no sun today in rainy old England so i can't show you all it's true beauty but it is so lovely. You get flashes of gold, oranage and pink. Wow! My boyfriend says this is a Kermit green and I do tend to agree. Do you own any Milani Holographics? I think I need to complete this set now! What is your favoyurite Holographic polish?